Have you ever thought about how much time passes between your child’s bedtime and breakfast? Depending on their age and when their bedtime is, it’s probably anywhere from 8-12 hours. That’s a long time considering kids usually eat something every 3-4 hours during the day. Research has shown that kids who eat breakfast do better academically and have fewer behavior problems than kids who skip breakfast. Although it’s important that kids eat breakfast, it’s just as important that they eat a healthy breakfast to fuel them through the morning. Although I’ve always made sure my kids eat breakfast everyday, I used to rely on a lot of frozen food when they were young, mostly out of convenience – waffles, pancakes, French toast. Unfortunately, as I discovered, many of these convenience foods that appear to be fine and somewhat healthy actually contain processed ingredients. For example, I used to buy low-fat whole grain frozen waffles for my kids, which on the surface sounded pretty healthy. However, reading the ingredient label tells a different story. First of all, enriched flour is listed before whole wheat flour which means there is a greater proportion of processed white flour to whole grain flour. Secondly, the ingredient list includes “natural flavors, malt flavoring, polyglycerol esters of fatty acids, soy lecithin and modified cornstarch.” I learned a few years ago that the term “natural flavors” does not equate to natural ingredients – in fact it often takes tons of different chemicals to create that “natural flavor.” As for polyglycerol esters of fatty acids, soy lecithin and modified cornstarch, I have no idea how these are produced, but these are not ingredients that I can readily buy, so I consider these processed ingredients. Granted, as a working mom, I was looking for the easy way out while making sure my kids had what I thought was a pretty healthy breakfast. However, about ten years ago, after I left the corporate world to stay home with my kids, I started paying more attention to what my kids were eating. When I discovered my youngest son had some food allergies almost two years ago, I really had to start paying attention to every single ingredient in any food I bought that came in a package. What I discovered was that so many of the prepared foods that appeared to be healthy contained fillers, and processed ingredients like soy lecithin. These days, breakfast during the school week is simple and usually consists of a bowl of hot oatmeal, a glass of orange juice and a banana. My youngest son tends to get a “fancier” breakfast simply because I’m a little bit more awake by the time he rolls out of bed – he might get a granola yogurt berry parfait, vegetarian refried beans topped with a poached egg, fresh avocado and salsa, egg and a hat, or scrambled eggs with garlic chives. In addition, he gets a fruit smoothie or a piece of fruit and a glass of orange juice. I’ve even served him whole grain toast topped with smashed avocado, sardines, a spritz of lemon juice, and fresh ground pepper, which he actually really likes. We’ve come a long way since our frozen waffle days, and my kids have come to appreciate a good home-cooked breakfast. 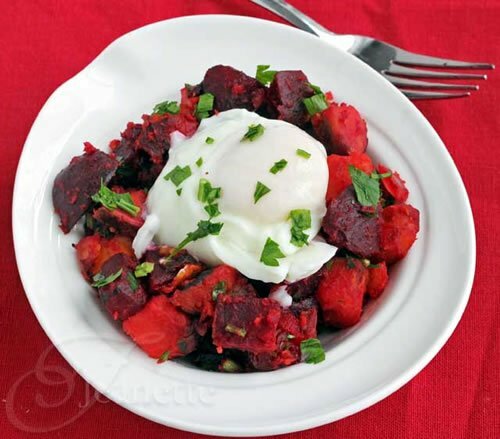 Although weekday breakfasts are simple, I like to make something special, like this Roasted Beet and Sweet Potato Hash, on the weekend or on a day off from school. 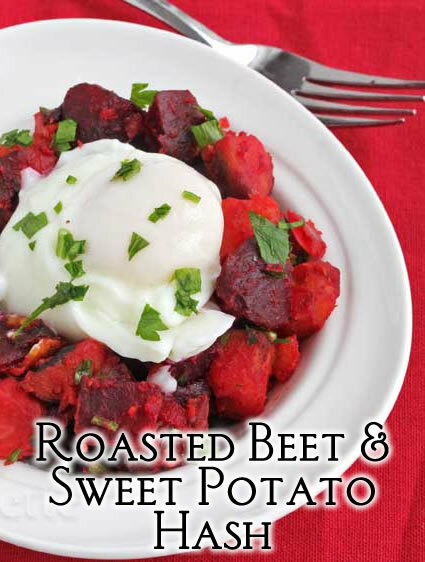 This is a great example of a recipe which I modified to amp up the nutrition by using beets and sweet potatoes. To be honest, I wasn’t sure how my kids would react when I served this with poached eggs one Saturday morning. I was pleasantly surprised to see them eat their plates clean. One thing that I am just in awe of is how trusting kids are – they trust that we as parents will feed them, clothe them and care for them to the best of our ability. When my kids are sick, they trust that I will do whatever I can to help make them feel better, whether it’s a bowl of homemade chicken soup or a cup of hot tea with honey. If I give them junk, they will eat it. However, if I provide them with real, unprocessed food, not only will they eat it, but they will be healthier for it. It’s a huge responsibility – their health is in my hands. After all, I have been buying their food, preparing it, and feeding them since the day they were born. Adapted from Whole Living. 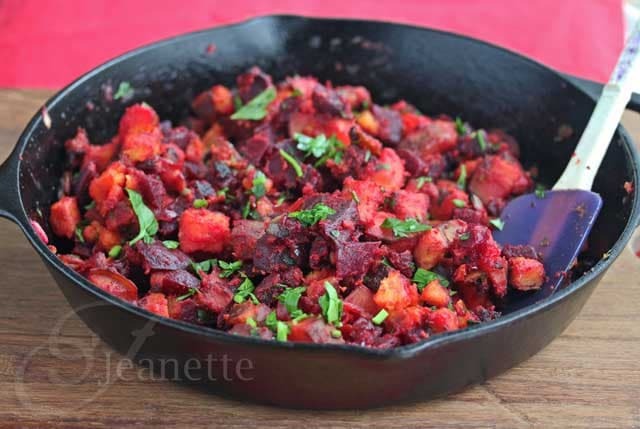 I actually had leftover roasted beets and baked sweet potatoes in my refrigerator when I made this hash, so it was just a matter of cutting everything up the morning. I added some turmeric for its anti-inflammatory and antioxidant properties. Preheat oven to 400 degrees. Place beet roots on a sheet of aluminum foil and drizzle with a little olive oil. Wrap beets in the foil. Prick sweet potatoes all over with a fork or knife. Place wrapped beets and sweet potatoes on a baking sheet and bake about 1 hour until cooked through. Use a knife to poke the vegetables to see if they are tender. Cool. Peel beets and sweet potatoes. Cut roughly into cubes. Heat oil in a large skillet. Add onion, beets, sweet potatoes and turmeric. Season with salt and pepper. Cook until bottom of hash develops a little crust. Flip hash over and cook until other side has a bit of a crust. Sprinkle with parsley. Divide hash among six plates. To poach eggs, bring a pot of water to boil. Reduce heat to low and crack eggs into slow simmering water. Cook for about 2 minutes or until desired (2 minutes for large eggs results in a runny yolk). Use a slotted spoon to remove from pot. Serve on top of hash. Jeanette Chen is author and photographer behind Jeanette’s Healthy Living. She’s the mom of four boys, and has a passion for cooking delicious and healthy meals for her family and friends. Jeanette believes that a diet rich in whole foods is the best way to prevent illness and disease. Her recipes are always full of flavor and pizzazz using whole ingredients and lots of spices. You can also find her on Facebook, Pinterest, Google+ and Twitter. Looks yummy, Jeanette! I can’t wait to try it. Thanks! Thanks Cheryl! It’s a nice change from regular hash browns. I was psyched my kids liked this. I love the added turmeric you used here. Great idea. I’m going to remember to add it to mine. I try to sprinkle in turmeric whenever I can – it doesn’t taste like much and it’s supposed to help fight infections and some cancers. Actually made this for dinner tonight and I added black beans and sautéed beet greens from the beet root. It was FABULOUS!! Thanks for sharing the recipe!! Missy – I love your additions – great one dish meal packed with protein and leafy greens! Made this for brunch today, but cut the recipe in half. It was so good I should have fixed the full recipe! Thanks for sharing. Colleen – so glad you tried it and enjoyed it. I made a full batch and had leftovers for the following week. It reheats nicely.